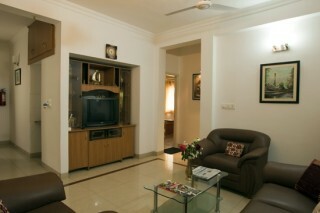 This property, with its string of contemporary amenities and warm ambience, plays the perfect host for leisure travellers. 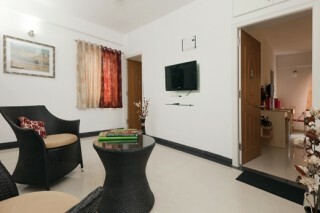 The elegantly furnished rooms invite guests for a restful sleep while the pleasures of vacationing in Bengaluru. 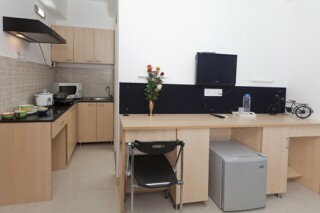 With a serviced apartment you can even have the flexibility of one property that you can use for multiple members of staff over an extended period. The upfront commitment means you benefit from great rates that hotels simply can't match. Plus, you have a base for your people that's available long-term at short notice. 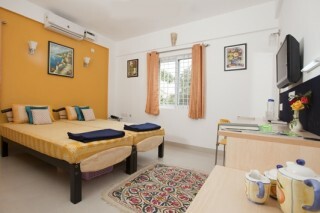 Full entertainment system including Cable TV with Digital Set Up Box High speed secure, free, broadband access and direct dial telephones Air conditioner superior quality bed linen and towels 24 hours hot water facility. Solar water heating facility with Geysers as back up. 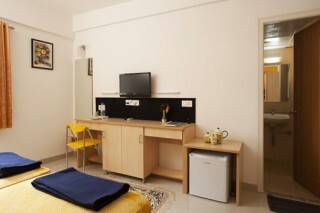 Washing Machine and ironing facility is available at the common area of the premises for a nominal charge. 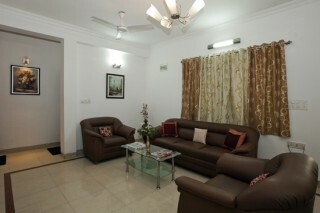 Two cots in each room, wardrobes, cupboards, reading tables. Ten Fully furnished Lobbies (shared across 33 rooms, one in each floor), which provides privacy and is available for the use ofthe guests to relax, meet visitors and have small discussions. External Laundry services may be arranged for a separate charge. Safe Lockers available for additional charge. Breakfast, Lunch and dinner is freshly prepared, exclusively for the live-in guests, in the fully equipped restaurant kitchens, (One in each Facility) with a pre-defined menu and served in the dining hall for a nominal charge. Kitchen is closed on Sunday afternoons for weekly maintenance. Places to visit: Lal Bagh - 6.9 km approx. Cubbon Park - 11.1 km approx. ISKCON Temple Bangalore - 27.9 km approx. Bannerghatta National Park - 25.5 km approx. Wonderla - 37.2 km approx. Ulsoor - 10.3 km approx. Bangalore City Railway Station - 14.3 km approx. Bangalore International Airport - 13.8 km approx. BTM Bus Stand - 600 M.